Boise State senior Zach Haney defends a New Mexico ball handler Wed. March 6, 2019, at The Pit in Albuquerque, NM. The Lobos won the game 73-72. Boise State basketball: Can Senior Night stop the slide? Usually there are good things happening for Leon Rice’s Boise State teams when Senior Night is celebrated. But despite this season’s tumult, Saturday’s game means a lot to Zach Haney and David Wacker. BOISE, Idaho — Friday, March 8, 2019. Boise State men’s basketball is set for the first 20-loss season in its history. The Broncos just don’t want to get there on Senior Night. 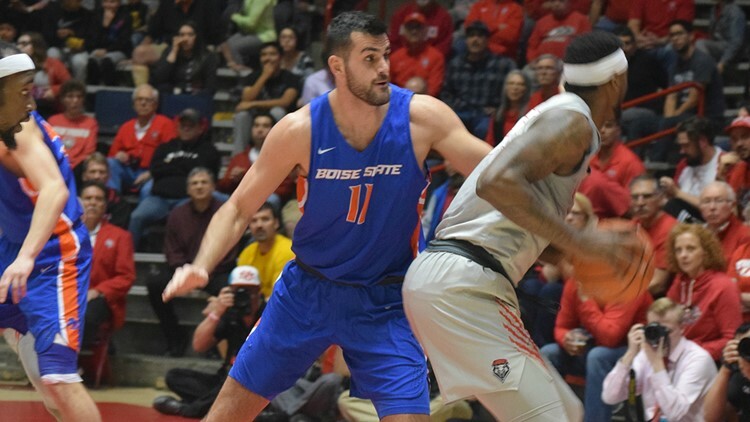 They host Air Force Saturday, trying to snap a six-game losing streak—and a two-game skid in Taco Bell Arena. They lost to the Falcons 74-60 in January in Colorado Springs. Boise State’s Senior Night will be relatively calm compared to the Chandler Hutchison-Lexus Williams-Chris Sengfelder ceremony last March, as Zach Haney and David Wacker are honored. Their senior season certainly hasn’t gone the way they had hoped, but both players have to be saluted as dedicated five-year guys in the program who never ceased playing hard. Haney and Wacker have combined for 242 games, more than 1,050 points, and more than 800 rebounds in their careers. KTVB’s Jay Tust tweeted this: “Sam Merrill is the Mountain West Player of the Year, right?” Tust pointed out that Merrill played 45 minutes and scored 38 points against Colorado State in Utah State’s 100-96 overtime win Tuesday night and has averaged 42.5 minutes and 29.5 points in the last five games. Then came a reply from Hutchison: “Would be a huge disappointment if someone who deserves it doesn’t end up getting it.” Not too hard to read between the lines there. As a Boise State senior a year ago, Hutchison was edged by Nevada’s Caleb Martin for the honor. This season it’ll come down to Merrill, Martin and the Wolf Pack’s Jordan Caroline. I’d favor Merrill, who has been central to the Aggies’ Cinderella run to at least a share of the Mountain West regular season title after they were picked ninth. Boise State showed some signs of cruise control Thursday night, but not enough to prevent it from finishing the regular season with an 80-60 win at Air Force. Coach Gordy Presnell kept fresh legs on the floor, with nine different Broncos playing 16 or more minutes. Marta Hermida led the way, scoring 16 points as Boise State won its 12th straight game over the Falcons. The victory gave the Broncos their best conference record in school history at 16-2; they’re 25-4 overall. Next up is the Mountain West Tournament, which this year begins on Sunday on the women’s side. Boise State, with a bye as the No. 1 seed, will play the winner of Sunday’s game between the 8 and 9 seeds, Nevada and San Jose State, on Monday afternoon. College of Idaho had a case of the yips to start off the NAIA Division II Championships yesterday in Sioux Falls, SD. It didn’t last long, though. The Coyotes missed their first eight shots from the field and committed four turnovers in the opening five minutes, as Voorhees College jumped to an 8-0 lead. It was all Yotes from there. Helped by a 44-25 rebounding advantage, including a 19-3 margin on the offensive glass, C of I ran past the Tigers 87-74. The Yotes meet three-time NAIA champion Cornerstone of Michigan this afternoon. In the GNAC Tournament, the Northwest Nazarene men rallied for a 76-75 win over Simon Fraser Thursday night and meet Seattle Pacific tonight in the semifinals. On the women’s side, NNU faces Western Washington in a semifinal this afternoon. The Idaho Vandals played themselves off the radar this winter, so you may not have noticed that last Saturday they broke their epic 14-game losing streak, their longest in 76 years. The Vandals edged Sacramento State 94-90 in their home finale at Cowan Spectrum. But the sunshine would be short-lived, as Idaho was routed 93-59 at Weber State Thursday night in Ogden. The Vandals, now 5-25, wrap up the regular season Saturday night with the Battle of the Domes against Idaho State in Holt Arena. The Bengals were thumped 91-62 by Eastern Washington Thursday night. Next stop for both teams will be the Big Sky Tournament next week at CenturyLink Arena. Pierce has been a playmaker since he burst on the scene as a true freshman in 2016. He’s recorded 125 career tackles and an interception, plus a sack in what ended up being his final game of the season last year in Laramie. With a healthy Pierce roaming the field at safety again, the secondary will have its most important glue. “He’s never not going to play well,” Harsin said. “That’s how he’s wired.” And surely it will rub off on his safety mate, fellow senior Kekoa Nawahine. The former Rocky Mountain star’s numbers slipped last year: 71 tackles and zero tackles after recording 108 stops and three picks as a sophomore. Nawahine is poised for a bounce-back. If the cards fall right, the Idaho Steelheads can clinch their 22nd consecutive postseason berth this weekend in CenturyLink Arena. Their current 21-year streak is already the longest in professional hockey. If the Steelheads sweep the final two games of this three-game set with Wichita—and Rapid City falls once in its two matchups with Utah—they are into the Kelly Cup Playoffs. Idaho is 35-20-4 with 13 games remaining in the regular season. Capital High completes the first undefeated season in Idaho 5A basketball in 19 years, beating two-time defending champion Borah 63-53 in the state title game to finish 26-0. The Eagles, coached by Paul Rush, were only the fourth unbeaten big-school squad since Idaho divided high schools into more than two classifications for the first time in 1958. Centennial had been the last to accomplish the feat in 1995. Capital had the other two unblemished seasons in 1975 and 1978, bookending the four straight state championships it won under Charlie Henry.